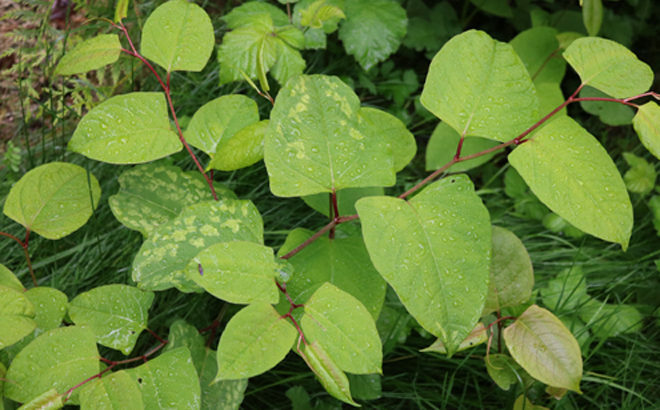 Japanese Knotweed is an introduced (non-native) plant species that has gone from a ‘harmless’ ornamental garden plant to a widespread, highly invasive plant species that has landed itself on BC’s top ten most invasive plant species list. It can spread quickly which creates dense thickets through their robust root systems. Roots may extend from the parent plant up to 20 metres, and grow downwards to a depth of 3 metres. The stems can grow between 1-5 metres in height. Their leaves can grow about 10 cm wide and 16 cm in length. Japanese Knotweed like moist and disturbed sites, which lead to riparian areas being highly susceptible to their presence, where seeds, and roots can dislodge and float down the water to establish new colonies of knotweed downstream. All this factors into reducing overall biodiversity in the area. They out-compete native plants, and can displace wildlife that require specific habitat requirements. They also can be highly destructive to infrastructure as the roots can break through concrete and asphalt. There is, however, some different uses of knotweed around the world. In the northeastern U.S. Japanese Knotweed is a source of nectar for honeybees, and will yield monofloral honey or bamboo honey. Japanese Knotweed is used in traditional Chinese and Japanese medicine to treat infections, inflammations and cardiovascular diseases.